Caption slip reads: "Photographer: Swaim. Date: 1958-05-26. Reporter: Kline -- Lal. Assignment: Caltech. 27/28: L to R, Dr. Lee A. Dubridge, Harold S. Vance of A.E.C., and Rear Admiral Albert G. Mumma. 1: Same group, but L to R, Dr. Lee A. Dubridge, Rear Adm. Albert G. Mumma, and Harold S. Vance. 2: Rear Admiral Albert G. Mumma, alone. 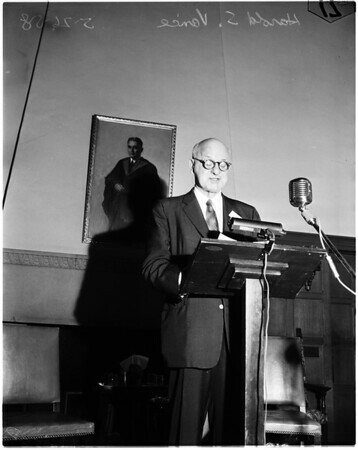 17/18: Harold S. Vance at mike, speaking".